Coit left one-third of her estate to the City of San Francisco “to be expended in an appropriate manner for the purpose of adding to the beauty of the city which I have always loved”. The city used this bequest to build Coit Tower on Telegraph Hill. allstaractivist note: My Mom and I were back in San Francisco this past Monday for my monthly room inspection and pest control spraying. We got there early and were driving around California street headed to Little Italy when I spotted the tower and suggested we try to go and see it. We drove around some of the steepest hills people are crazy enough to build upon, to no avail. We only found steps leading to the tower that seemed to go on for infinity. My Mom is eighty, about fifty steps is her limit. We spotted another elderly lady standing on the corner and in typical native San Franciscan spirit, she gave us impeccable directions with the order to enjoy ourselves. “Yes they have parking under the tower.” “Go on up there and see it, you’ll enjoy yourselves!” Thanks to her dead reckoning, we found our way there and below are the scenic views we were rewarded with. Neither I nor my Mom had ever been to Coit Tower, now we both can scratch that off our bucket list. We didn’t actually go up the tower, that would have cost $11 we didn’t have. It is $5 for seniors and $6 for San Francisco residents, which I am. On Wednesdays and Saturdays we were informed that there was a guided tour complete with full narratives for the murals. They are very interesting murals and not painted by Diego Rivera as I had come to believe, but by government subsidized (Public Works Of Art Project) local artists during the Great Depression. The lobby attendant explained that the artists had been heavily influenced by Diego and chose to paint the murals in his style. Mom and I plan to go back when they are giving the free tour and then pay the elevator fee to go up as well. Visiting the lobby, murals and grounds are free, seven days a week. 10am-6pm May through October and 10am-5pm November through April. One of the most unusual personalities ever connected with our Fire Department was a woman. She was Lillie Hitchcock Coit, who was destined not only to become a legend but to attain that eminence long before her life ended. She came to this city on the ship Tennessee in 1851 from West Point, where her father, Dr. Charles M. Hitchcock, was stationed. Dr. Hitchcock served in the U.S. Army during the Indian Wars. During the Mexican War he performed a splendid piece of surgery on Colonel Jefferson Davis, saving his leg. Davis went on to be U.S. Secretary of War and President of the Confederacy. Seven years later, when only 15 years old, she began her famous career with Knickerbocker Engine Company No. 5. On one afternoon that pioneer fire company had a short staff on the ropes as it raced to a fire on Telegraph Hill. Because of the shortage of man power, the engine was falling behind. Oh, humiliating and bitter was the repartee passed by Manhattan No. 2 and Howard No. 3 as the total eclipse seemed to be but a matter of seconds. Then suddenly there came a diversion. It was the story of Jeanne d ‘Arc at Orleans, The Maid of Sargossa and Molly Pitcher of Revolutionary fame all over again. Everybody did come and pull and Knickerbocker No. 5 went up the slope like a red streak and got first water on the fire. That was a famous day for Lillie. From that time on she caught the spirit of the Volunteers and Dr. Hitchcock had difficult work attempting to keep his daughter from dashing away every time an alarm was sounded. As it was, there never was a gala parade in which Lillie was not seen atop Knickerbocker No. 5, embowered in flags and flowers. She was, literally, the patroness of all the firemen of her city. From her earliest infancy she was curiously fascinated by the red shirt and warlike helmet of the firemen and she gloried in the excitement of a big blaze. Almost invariably, with the energy and speed that the most agile fireman might envy, she hastened to the scene of action. Lillie often said she loved courage in a uniform. San Francisco society of that day was exclusive and rigid. As the Hitchcocks were valued members, society frequently agonized over the vagaries of its Lillie. But she seems always to have done exactly as she pleased without giving real offense. On October 3, 1863, she was elected an honorary member of the Knickerbocker Company, and always regarded that honor as the proudest of her life. She wore the numeral as an ornament with all her costumes, along with the gold badge presented at the same time. As Miss Hitchcock became older, she gave up the habit of following the engine, but the tie that bound her to the company was as strong as ever. If any member of a company fell ill, it was Lillie Hitchcock who gladdened the sickroom. And! should death call him, she sent a floral tribute as final expression of her regard. After her marriage to Howard Coit, a caller at the San Francisco Stock and Bond Exchange, she traveled extensively in the East, in Europe and the Orient. Notwithstanding all her wanderings, her love for California was steadfast and she at length made it her permanent home. She was a notable figure even at the court of Napoleon III and a maharaja of India, and later when she came back to San Francisco to live she brought with her a remarkable collection of gifts from royalty and others. They included gems of rare value, object of art, mementoes and souvenirs, some of them priceless. When Mrs. Coit died here on July 22, 1929, at the age of 86, she gave practical evidence of her affection for San Francisco. She left one-third of her fortune to the city “to be expended in an appropriate manner for the purpose of adding to the beauty of the city which I have always loved.” For several years after her death, there was question as to the most fitting interpretation of the “appropriate manner” in which to make the memorial. The executors of her will at last determined to erect a memorial tower in honor of this colorful woman and also a memorial tribute to San Francisco’s firemen. Both have been completed for some time. The novel appearance of the 185-foot cylindrical tower which stands atop Telegraph Hill is surely a significant symbol to the memory of one whose individuality made her as outstanding an example of contrast to her days as is this unusual form of memorial shaft. The second memorial to her was unveiled in Washington Square, December 3, 1933. It is a sculptured block representing a life-sized group of three firemen, one of them carrying a woman in his arms. She always wore a little gold 5 pinned to her dress and signed herself Lillie H. Coit5. She asked that this 5 be left on her at the end. Everything she had, even her linen, was marked – L.H.C.5. Lacemakers even worked it into her monogram on her fans. Mrs. Coit passed away July 22, 1929. Had she lived a few more weeks she would have been eighty-six years old. Before the cortege reached Grace Cathedral a company of firemen fell in ahead and led the procession. At the Cathedral steps stood three of the four living volunteer fire men: Samuel Baker, Captain J. H. McMenomy, and Richard Cox. They constituted themselves a special guard of honor and proceeded the pall bearers. At the end of the service someone tried to hurry these old Volunteers – but they took their own time and each laid his hand reverently on the casket and paused to say his silent goodbye before the procession could move on. They felt that she belonged to them and it was exactly what she would have liked. There was money left over in Lillie’s bequest after the building of Coit Tower. The remaining available funds were used for a statue dedicated to the volunteer firemen of San Francisco. This statue, in Washington Square, is of three firemen, one of them is holding a small child. This monument is one of the few pre-9/11 monuments in the United States that honored firefighters. 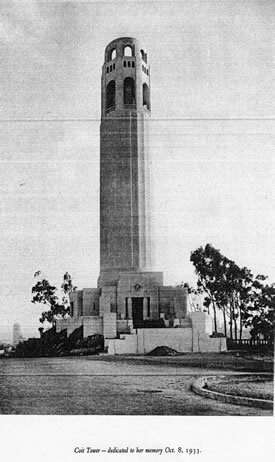 On October 8, 1933, city officials, civic organizations, the army, the pioneers, the Sons and Daughters of the Revolution, the Sons and Daughters of the Golden West, the firemen and old friends gathered there to dedicate this tower to the memory of the one they had always loved. The myth is that Lillie Hitchcock Coit was the first woman firefighter in the United States. At age 15 (1858) Knickerbocker 5 adopted Lillie as their mascot and in every parade she was given the honor of riding atop the engine’s wash box amid wreaths, garlands and bouquets of choicest flowers, like some ballroom belle. Previously, Lillie had been considered the pet of the young gold rush town of San Francisco. At age 17 she and her mother left for Paris and returned three years later in the spring of 1863. Upon her return Lillie quickly became the belle of San Francisco. On October 3, 1863 Lillie W. Hitchcock was voted an honorary membership of Kinckerbocker 5, and was given the following rules by the company. She was expected to go to all fires that occurred during the day. At night, if her light was not burning until her engine was housed she was fined. With the esteemed position of honorary membership, she was allowed to wear the parade uniform of the company; a fireman’s red shirt, a black skirt (instead of pants), a parade helmet with her initials, and a formal parade belt from the Veteran Firemen’s Association of San Francisco. Lillie’s helmet and her 1863 honorary membership certificate and now on display at the SFFD Museum. On her own she helped pull the engine of her company to the fire as a young girl. She did help with the social events of her company. She did visit sick members of the company, even well after the company was disbanded. She did assist with a proper burial of the firemen of her company if their families could not afford it. In Paris during 1860 and 1863, she was taught how to dance by the head of the Ballet School. Page 26 This training made her the envy of every woman at a dance. Lillie’s dance card was always quickly filled after her entrance. She traveled to Paris often and she was a notable figure at the court of Napoleon III. On November 19, 1868, she married Benjamin Howard Coit. Howard Coit was an elected (1870) caller of the Stock Board during the tremendously exciting days of the Bonanza strike (of the Virginia City Comstock Lode). Page 27. His remarkable aptitude for the position, secured him a salary of $1000 a month. Mr. Coit died of heart disease during sleep, May 14, 1885; at the age of 47. Lillie was a finished poker player. Page 27 During her married life her home was the rendezvous for the state builders – Ralston, Sharon and others – and these men recreated at night by playing poker. Mrs. Coit was as good a player as any of them and was often the only woman in the game. Lillie was an accomplished carriage driver. Page 31. Not only was she a fancy driver, but she could tool her four-hand over any mountain road for Mrs. Coit had some of the best old stage-drivers come to “Larkmead” to instruct her. Coit Tower was designed as a fire nozzle to honor Lillie Coit and the San Francisco firefighters. The 210 foot tower was designed by Arthur Brown, Jr. (1874-1957) an American architect based in San Francisco who had stated on many occasions that his tower was not designed to resemble a fire hose nozzle. Mr. Brown also designed many other San Francisco buildings such as the Beaux-Arts City Hall (1915) where his attention extended to the smallest details, such as, light fixtures, floor patterns and even doorknobs that feature the seal of the city. In 1932 he designed the War Memorial Opera House and in collaboration with G. Albert Lansburgh, the Veterans Building. He designed the rotunda for the City of Paris department store at Geary and Stockton Streets which is now preserved in the Niemen Marcus building. His other accomplishments extend throughout California and across the Nation. allstaractivist note: It was surprising to me just exactly what the political climate was back when Coit Tower was erected. I am not associating Mrs. Coit with any political ideology whatsoever, the tower was conceived of and built long after her death. I do wonder if she would have approved of the fascist symbolism on the front, or of the socialist murals inside. I don’t think so being the free spirit that she seemed to be, deriving her wealth from Capitalism. It may have actually been a dishonor to her. I have not read the book below, but it seems to do a pretty good job of capturing the political beliefs of the day. Many people don’t know just how closely we were involved with fascism and socialism back then, some would say we still are. Coit Tower was built during this time and is a good reflection of the era. The book below might help those so interested get a better understanding of our journey from back then up to our present day. A new President takes office amidst economic and financial turmoil. A business community is bruised and battered from public condemnation. A controversial and ambitious political agenda with far-reaching consequences is fiercely challenged across the country. A dangerous foreign ideology overshadows American debates on security.2009? Not exactly. It was 1934, and one year into Franklin Roosevelt’s administration, powerful forces were gathering to oppose the New Deal. Some were comical, like the Silver Shirt militiamen who wore ill-fitting uniforms emblazoned with a giant L for “Love, Liberty, and Loyalty.” Others were deadly serious, like the heir to the Singer sewing machine dynasty who admitted he was willing to spend half of his thirty million dollar inheritance in order to save the other half by overthrowing the U.S. government.In STATE OF EMERGENCY, Nate Braden brings these various threads together to show how the United States was closer to revolution in 1934 than at any time since 1776. Relying on thousands of pages of testimony from the House Un-American Activities Committee – held in executive session and kept classified for decades – he crafts a spellbinding story of a troubled country rocked by political and economic upheaval.While countless books have been written on the Depression, Braden sheds new light on a host of fascinating, forgotten characters who hatched an incredible scheme to make Franklin Roosevelt the last American President.There was the private wealth manager from New York who visited Germany and was inspired by Hitler to create a paramilitary force of 500,000 men modeled on the Nazi Brownshirts. He had $700 million in assets to finance this private army. Thanks to his friendship with a high-ranking Army officer, he was able to tour Civilian Conservation Corps camps in Maryland with the intent of using them as staging areas for his men to march on Washington.There was Douglas MacArthur’s deputy chief of staff; a man who despised Franklin Roosevelt and everything he stood for, advocated the forced sterilization of foreign “undesirables,” and believed “the problem of the Jew in America must be studied and solved without further delay.”There was the West Point graduate and co-founder of the American Legion who returned from World War I to start a successful Wall Street brokerage firm. A passionate libertarian, he was convinced the New Deal was a front for a Communist revolution. Quietly, discreetly, he began to work through chosen agents for an end to democratic rule in the United States.There were the disturbing signs that America’s social and political fabric was unraveling. From the Farmers’ Holiday insurrection in Iowa to the Bonus Army riot in Washington, the writing was on the wall – after three years of Depression, the American people weren’t going to take much more.There were the cadres of paramilitary organizations cropping up with alarming frequency across the country. Most were pompous and impotent. Others had cash and cunning; men who were making plans to assassinate public officials and take over city halls, hiding weapons near major population centers in the event the time came to act.